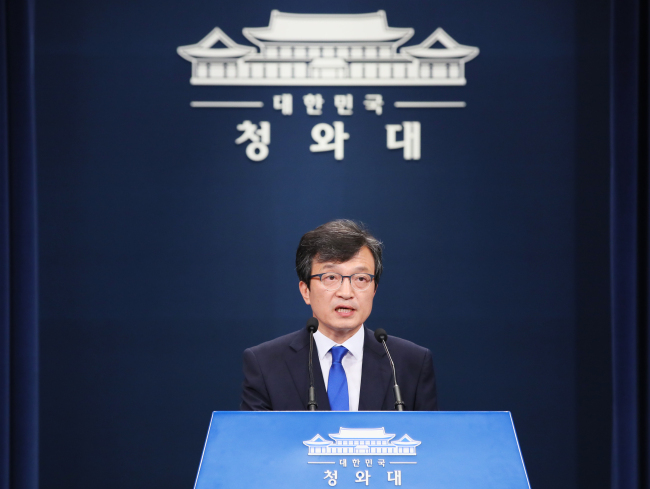 President Moon Jae-in has ordered an independent probe into the Defense Security Command drawing up plans for martial law during the protests against Park Geun-hye administration, Cheong Wa Dae Tuesday. “The independent investigation team will be made up of non-Army, non-DSC military prosecutors. The team will not be commanded by the defense minister, and will conduct the investigation independently,” Cheong Wa Dae spokesman Kim Eui-kyeom said. Kim added that Moon ordered the independent probe as there could be a large number of former and current officials of the Ministry of National Defense involved in the case. According to Kim, Moon gave related orders to Minister of National Defense Song Young-moo on Monday. Moon is currently in India on a state visit. The Defense Security Command is an organization within the military tasked with counter-espionage, intelligence gathering and investigating criminal activities within the military. The organization, however, has been accused of a number of irregular activities meddling in politics, including an attempt to rig online public opinion. It was recently revealed that the DSC drew up detailed plans for deploying military units, including special warfare units, if martial law is declared in response to the anti-Park protests of 2016 and 2017. The protests, referred to by the current administration as “candlelight revolution,” led to the ouster of former President Park Geun-hye over a massive corruption scandal. The DSC is also alleged to have surveilled families of those who died in the Sewol ferry disaster. “Defense Ministry and Cheong Wa Dae officials looked into the matter closely considering the seriousness and explosiveness it represents,” a high level Cheong Wa Dae official said. He added that the president seems to have considered the matter too urgent to be left until his return. Moon is scheduled to return Friday from his state visit to India and Singapore. The official also said that the independent probe team will follow the operations method of similar teams organized within the prosecution. The investigation team will be led by a leader named by the defense minister, but that the lead investigator will not report to or receive orders from anybody until the investigation is over, the official added. The official, however, drew the line at the investigation being linked to DSC reform.